William Jefferson Clinton seemed destined for political greatness. After meeting President John F. Kennedy, a young Bill dedicated his life to politics. He had served five terms as Governor of Arkansas before turning his attention to the Presidency. Considered a long shot to beat incumbent George Bush, the 47 year-old Clinton forever changed how political campaigns are run and won the first of twoterms in office. Despite occasional political troubles, Clinton remained immensely popular with the American people throughout his political career. During his terms, America experienced tremendous economic growth and had a federal budget surplus for the first time since 1969. When he left office in 2001, his job approval rating of 68 percent was higher than any other departing President's sincepolling began more than 70 years earlier. Today, Bill Clinton continues to use his popularity to raise money for disaster relief and other charitable endeavors. 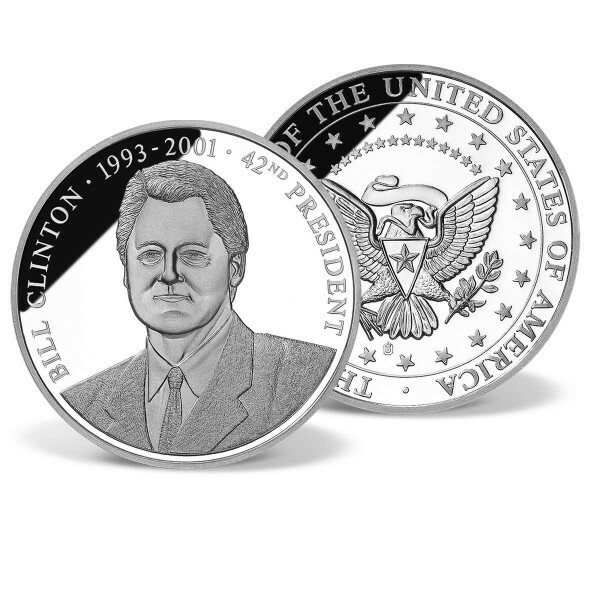 Meticulously designed, this dazzlingtribute to the 42nd President of the United States features a highly detailed engraving of Bill Clinton on the obverse and is strictly limited to only 9,999 complete collections worldwide. This coinis minted to the highest quality "Proof  standard and comes in its own protective capsule to preserve it for generations to come - a true collector's item. As an astute collector, you understand thevalue of owning such an exquisite coin.